Kanebo does own a large number of sub brands and among them, Ururi. 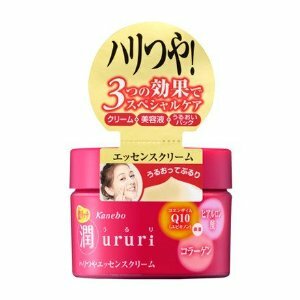 Kanebo Ururi is specialized into skincare products and I’ve tried their ‘Rich Haritsuya Essence Cream’ which is a 3 in 1 product (Essence, Cream and Moist Pack), claiming to have a special aging care. The jar looks simple with hot pink-red color and a prom adhesive that is used as a freshness guarantee at the same time. It is in plastic and quite light in weight so I think it would not take a lot of space if you’d like to take it with you in travel. The cream inside is white, tending to yellowish, and smells quite good (It smells a bit like a cream from Nivea actually, with more floral scents). It is a bit thick on fingers so I don’t use a lot per use and due to this thickness, it doesn’t get absorbed quickly, it is even a bit sticky… I’m using it as a night cream so I don’t mind feeling sticky since I don’t have to wait to apply makeup but I guess if I would use it as day cream, it would be bothering. About the claimed effect now, the cream includes hyaluronic acid which isthe best for moisturizing, as well as collagen for giving elasticity and tightening the face’s contours. It contains also coenszyme Q10, known for its effect on wrinkles appearance with its antioxidant properties. I’ve been using this cream for some months now but I haven’t noticed something particular about any anti aging effect. Maybe my skin is a bit tighter at the contours, but nothing happened for most sensitive areas like under eyes. I guess I have to wait more to see any result, though I’m not very convinced for a product that some shops dare to sell for between 20 and 30€.